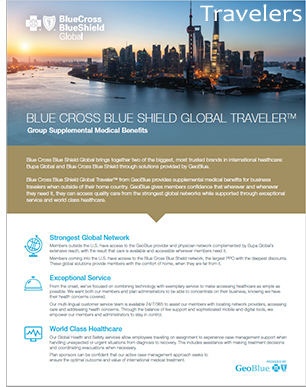 GeoBlue is now part of Blue Cross Blue Shield GlobalTM is a new leader and innovator serving the needs of world travelers. Blue Cross Blue Shield GlobalTM products and services are designed to provide healthcare coverage solutions that can meet the needs of all globally mobile individuals and businesses, wherever they are in the world. That includes options for U.S. employees traveling or working in other countries; for foreign nationals traveling or working in the U.S.; and for foreign nationals working in or traveling to countries other than the U.S. In every case, members will continue to enjoy the Blue Cross and Blue Shield experience they've come to know. GeoBlue's worldwide community of English-speaking, western-trained physicians brings members top-notch medical care no matter where their assignments take them. Members can travel with confidence, knowing an experienced GeoBlue global health coordinator will schedule doctor appointments, guarantee payments for cashless access to care and arrange for any necessary follow up treatment. GeoBlue's state-of-the-art mobile tools empower members to decide what level of care to seek and to quickly identify the best and most convenient options. These tools include medical terms and medication translation databases for navigating all levels of care. GeoBlue plans are underwritten by 4 Ever Life. With over 60 years of experience in enhancing protection, 4 Ever Life is rated "A-" (Excellent) by A.M. Best and licensed to provide health and life insurance solutions in all 50 states, the District of Columbia, and Puerto Rico. 4 Ever Life Insurance Company is an independent licensee of the Blue Cross and Blue Shield Association. Strength of the power of Blue! GeoBlue offers a full range of group plans with comprehensive benefits and competitive rates. All plans are distinguished by the highest standards of service delivering. GeoBlue members enjoy access to a carefully selected global provider community including the BlueCard network while in the U.S. In the US, products are offered in cooperation with Utah, Regence Blue Cross Blue Shield of Utah. GeoBlue Expat combines comprehensive global benefits with a new generation of medical assistance services. GeoBlue Expat is designed for international assignees and their families when they leave their home countries for six months or more. GeoBlue's Expat plans offer global security intelligence that keep employees safe and informed. Unsurpassed Internet resources promote personal safety by giving members convenient access to vitally important tools and news. Human Resources and Benefit professionals understand the risks involved with sending an employee and their family abroad on a foreign work assignment. Providing your workers with the best available tools while away help the employees peace of mind, knowing they will be provided excellent medical insurance coverage, access to quality medical professionals, help with foreign medical laws and systems and help, advice and coordination when emergencies strike. International Employees who travel to several global locations can enjoy having one international medical policy to take with them regardless of where they are in the world. And, not all employer groups are looking for a group Intnernational health insurance policy for the company but rather a more targeted approach for a smaller number of employees that have agreed to accept a new assigment abroad. Having a solution for the needs of an employer who make seek coverage for a single employee, a small group starting with as few as 2 employees or a much larger group, Blue Cross Blue Shield Global and GeoBlue more than likely has a product to fit your needs. Like GeoBlue, Blue Cross Blue Shield Global delivers the highest levels of service by continually focusing on member needs and convenience. They understand how challenging it can be to find doctors you can trust when you need them most. Arrange easy access to care with one of their contracted providers by requesting and appointment. Long-term relation-ships with doctors and hospitals mean that members can be seen quickly and do not need to file a claim and wait for reimbursement. Coverage is global and there are no restrictions on the time a member can spend in the U.S.
City-level Security Profiles for over 200 destinations outside the U.S. The Traveler provides group supplemental medical benefits and services for international business travelers. 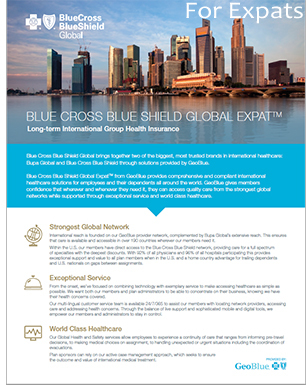 Blue Cross Blue Shield Global group health plans combine unsurpassed service with state-of-the-art technology to help business travelers conveniently access trusted doctors and hospitals around the globe. With a large and growing worldwide contracted community for English speaking, western-trained physicians, GeoBlue helps members get the care they need no matter where their assignment takes them. One third of all short-term business travelers suffer an illness or injury while on an international assignment. The pace and stress of the trip often compromise the traveler's health as well as the organizations objectives.